⚓ T58501 Node Wrangler conflicts with "Toggle Maximize Area"
Node Wrangler conflicts with "Toggle Maximize Area"
Try maximizing the shader editor with nodewrangler enabled. 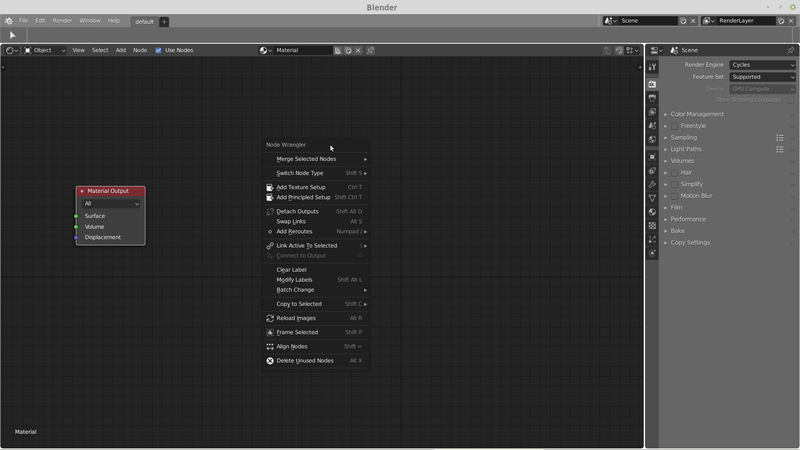 user1 (user1) edited projects, added Addons, BF Blender: 2.8; removed BF Blender. Sebastian Parborg (zeddb) added subscribers: Sebastian Koenig (sebastian_k), Sebastian Parborg (zeddb). Or Shift+W (as an 'alternative' context menu)? At least for me personally, I would prefer shorter commands (like Shift+W) as it feels that Ctrl+Shift+Alt+Space is a bit too many keys. Philipp Oeser (lichtwerk) added a commit: rBA6e8a752d6ed9: Node Wrangler: change NW menu shortcut to Shift+W.